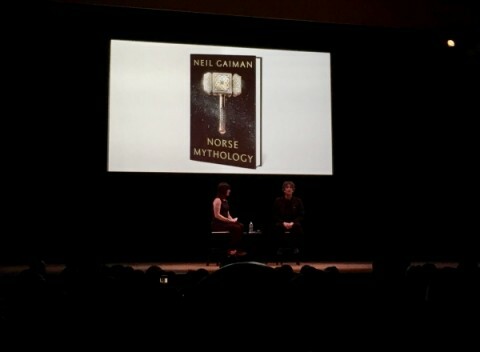 One week ago, despite a storm descending on New York City, I attended a Neil Gaiman reading and Q&A to celebrate his new novel, Norse Mythology. Walking into The Town Hall to receive my very own signed copy of Gaiman's new novel, my excitement reached mythic proportions. 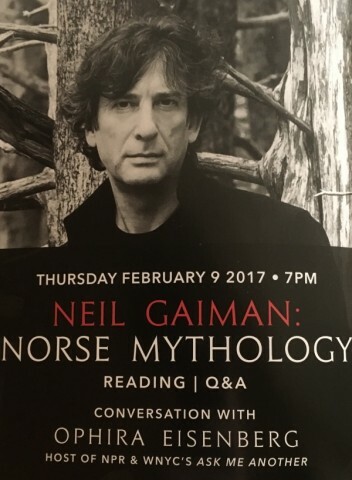 The event began with Neil Gaiman, clad all in black, opening a copy of Norse Mythology to begin his reading. 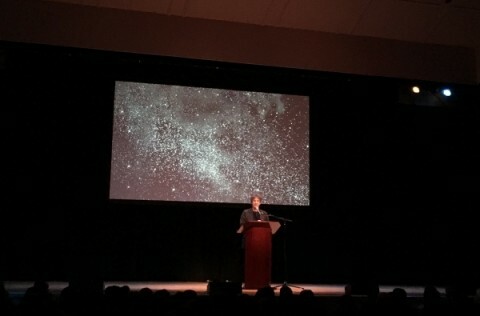 As an audience, we were treated to a short story titled "The Master Builder," in which Gaiman has retold a story about the building of a wall to separate gods from giants. The story was, in the simplest of terms, "fitting." What Neil Gaiman does in this new novel is retell mythic tales with characters that feel real and authentic. In his introduction to the new books he has written, "History and religion and myth combine, and we wonder and we imagine and we guess." Such a statement is somewhat of a road map for how Gaiman tackled the writing of this book, taking to these tales as if he were a musician covering songs, as he said. After the reading in which we laughed and took pause for what was happening beyond the world of myth and the enchanting experience of listening to Neil Gaiman read, we were given a new trailer for the Starz adaptation of "American Gods," which looks fantastic. We were also given a trailer for a soon-to-be-movie starring Elle Fanning adapted from Gaiman's short story "How to Talk to Girls at Parties," which also looks out of this world! Once the viewing was complete, Neil sat down with Ophira Eisenberg to answer questions submitted by audience members. Now some of my favorite things he said might not have been favored by others, but with the broad range of questions, there was sure to be something for everyone as Neil spouted wisdom from his years as a storyteller. And after all, it is his stories that had brought all of us together. Whether it be American Gods or Stardust or The Graveyard Book or Neverwhere, to which he revealed he is writing an epic sequel spanning close to 400 pages, it didn't matter the favorite. What mattered is that Neil told the stories we are still talking about. His hope for this newest book seemed two-fold: 1.) That someone in twenty years will decide to retell the Norse myths when his becomes obsolete as so many things do after time, and 2.) 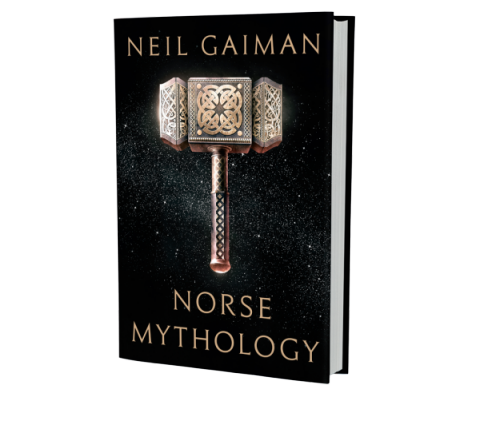 That by reading this book children will become infected with a love of Norse mythology and reading. Neil Gaiman has always been a true champion of young readers and keping stories scary and real for them. The second to last question asked of Neil had to do with what we should expect from his epitaph to which he responded, "We don't know if he's actually under here." Following the Q&A was a separate signing for those possessing other copies of Neil's books, which I had completely forgotten to bring, and so, sadly, did not attend. But I did leave The Town Hall with a signed copy of Norse Mythology and a renewed sense of spirit for storytelling and the stories which exist in places beyond our world. Friday, 19 October 2018 Featured Review: The Golden Boy by Seven Steps & Audrey Rich! Thursday, 18 October 2018 Featured Review: Someday by David Levithan! Thursday, 18 October 2018 Author Chat with Thommy Hutson (Jinxed), Plus Giveaway! Wednesday, 17 October 2018 Featured Review: Dark Fates by GK DeRosa & J.N. Colon! Wednesday, 17 October 2018 Author Chat with Michelle Kenney (City of Dust), Plus Giveaway! "WONDERS OF NATURE is a gorgeously illustrated, oversized book that discusses birds, fish, and bugs in an approachable way for..."
"Jeremiah Denton was a naval aviator who was shot down and captured by the North Koreans in 1965, and was..."